Note that the BLF-lanyard shown in the pictures is NOT included. I bought it earlier from manafont and I think it suits this light very well! Features, well, ... It's a flashlight body, that's it. It works well and seems to be waterproof. Tailcap switch is forward clicky and feels good in use. Maybe not so good for multi-mode drop-ins? Value for money: A bit pricey, especially as the drop-in is not included. -1 star for this. Design is nice. The light is quite heavy (480g without batteries, 630g with two batteries + two dummies = ready to use), and feels very good in hand. The anodization is good overall, so let's see some details..
And the walls are THICK, like 7.5mm thick! Perfect! Up to four batteries will allow really long runtimes with a suitable drop-in. The KD XM-L U2 3-18V drop-in takes about 0.5A from 4 x 18650, allowing something like up to five hours runtime on high. This is not a DRY, but in par with other P60 lights. Thermal sag is significant, at least before doing the aluminum foil trick. After that, the thick body takes all the heat very well. 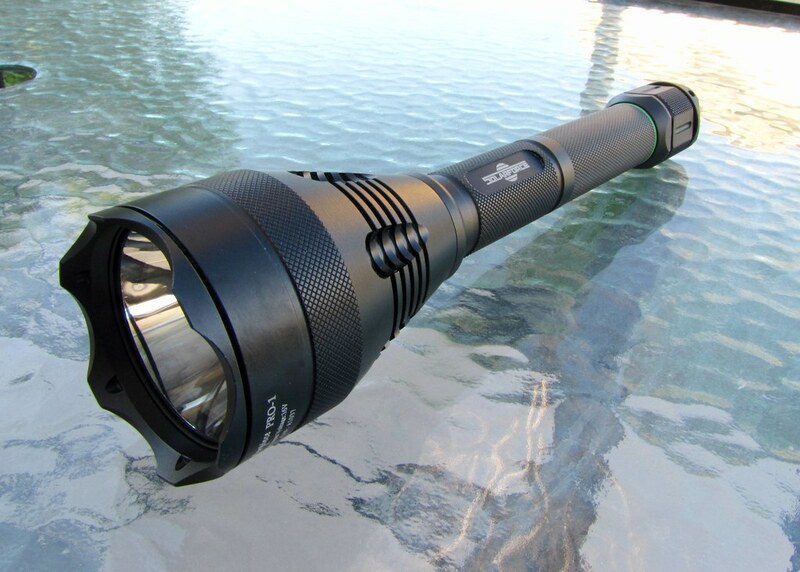 Very good flashlight for anyone who wants to have something heavy that gives some extra reach in case of being attacked. I would not classify this as an attack weapon, so there should not be any problems with police, but YMMV! Some HD bonus material in gigapan format. You can navigate in the embedded images by using mouse wheel / drag / double click / navigation controls (on the left) or just click the title to open these in gigapan.org, which allows to use full screen view, create snapshots and add comments. I was really impressed with the AR-coated glass. My example also arrived with similar damage to the packaging. I really like the bezel too- it may migrate over to the L2T for a while, while the Masterpiece Pro 1 head resides on the Glad. I don't own the other torches in your comparo - can you please comment on which one is the most solid-feeling of the group? In other words, which one would club the most zombies without falling apart? If you have the time, could we see an in-hand photo to get a reference for size? That'd be great thanks! From the department of nobody-cares-but-Foy: check out that boot design! Great review. I think the BLF lanyard came from Manafont? My bad. Sure it did. I stand corrected. I care... cause my Blue L2P has that same tailcap. I guess SF is using them on new lights. Wow...7.79mm thick body! That could be even thicker than the Trunite catapult? This one, for sure. The baseball bat is overall heavier and more solid, but the handle is not as thick as in Gladiator. Also The Mace feels quite thin-walled when compared to this. Masterpiece Pro 1 head resides on the Glad. Do you happen to have a photo of that combination? I'm struggling not to buy MPP-1. What is the body thickness measured from bottom of those knurlings or rough estimate if it´s not possible to measure accuratelly? I would probably buy the MPP-2 to go with this combo, if purchasing new. While not a perfect fit, it balances nicely with the larger head. he he . . . You're going to love your MPP 1. Now I know that I needwant it. But I can't decide: I have always wanted to have MPP-1, and it can use up to 4 x 18650. But then again, MPP-2 would be a good option as well (even though it takes "only" 3 x 18650)..
Luckily there's the good old BLF saying: "When in doubt, take both". I have both and people probably get tired of me saying it but; the MPP 1 will give you a new respect for the ubiquitous XR-E. Of the two, the MPP 2 is brighter but the MPP 1 is a thrower extraordinaire. Versatile too - can run on a single 18650 or up to 16 volts and it will screw onto an L2, L2P, L2T, L2X, L2i, L2r, L2m . . . the MPP 2 tube will even work with it. If you own just about any Solarforce light, all you need is the head. In fact, a Surefire 6P will fit as well. The MPP 1 setup I like best is an L2P body and an extension tube with the S8 switch. Hmm.. What would be the thickness of the beast? 1. Which one has the brightest beam? 2. Which one is the most durable? 3. Which one works best as a weapon? 4. Which one works the best as a flashlight? The beam on the Solarforce Gladiator is very narrow. Is the beam's side spill useable? Well. The beam on Gladiator depends on the P60 drop-in you use with it. I'm using a XM-L dropin and, IMHO, the beam is not narrow at all. Actually it's quite the opposite: floody and bright. Thanks for the feedback on the beam. _the_, since you own the Solarforce Gladiator, the club, and the baseball bat, if you had to pick only one to keep, which one would you choose. Tough choice. I think it would be the Gladiator, because it really doubles as a multipurpose flashlight (with changeable dropins / heads). Where cheapest to get that mpp head ,I like that on the gladiator?